We weren’t ready to leave the Texas Hill country just yet. With Inks Lake full for Easter weekend we had to vacate our lake front campsite and find another place to stay. We really liked the town of Llano and found a private RV park beside the Llano river that had a site for the three nights. Enchanted Rock State Park is short drive south of Llano so on Saturday we set out early in the morning in hopes of beating the Easter weekend crowds. We arrived at the park entrance before 9:30 only to find a line of cars waiting to get in. It only took a few minutes to get our parking permit, park and head for the summit trail. Many families were out enjoying the climb to the top. The highest point of Enchanted Rock 1,825 is feet above sea level. Climbing the Rock is like climbing the stairs of a 30- or 40-story building. My fitbit said I climbed 56 floors that day! We had a great time at the Llano Fiddle Fest. After a picnic lunch at the bottom of Enchanted Rock we returned to Llano to go the LanTex Theater to hear some of the fiddlers in the 38th Llano Open Fiddle Contest. I don’t know anything about Texas Fiddling but I know I enjoyed all of the contestants we heard. On Sunday morning we drove to the Llano Museum to hear some more fiddling and eat a Cowboy Breakfast put on by the Llano Historical Society. We got there as the ladies were starting to put everything away but they told us to come on into the kitchen for some biscuits and sausage gravy. The volunteers were so friendly and nice. I love small towns! Spencer and Rains were playing old time fiddle tunes in one of the rooms in the museum. Tricia Spencer grew up in Kansas and learned to play from her grandparents. Howard Rains is a native Texas artist. We enjoyed listening to their music and bought one of their CD’s. Saturday afternoon after climbing Enchanted Rock and listening to fiddling we returned to Cooper’s BBQ to get some take out for our Easter dinner on Sunday. The line was wrapped around the building but after a short wait we arrived at the pits to choose our meat right off the grill. We chose a chicken half, brisket and pork tenderloin. We got some beans, sauce, and jalepenos to go with it and were back at the campground to rest after our busy day. Riverway RV Park was our home while in Llano. This private park takes Passport America and Good Sam. All the sites are large pull through sites with full hookups, WiFi, and cable. There is a large clubhouse with kitchen, meeting room and a very nice laundry. 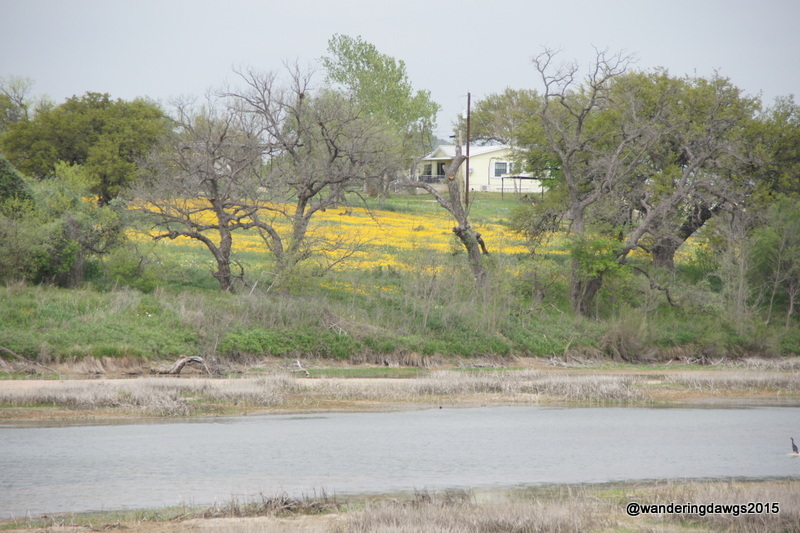 The RV park is located on the Llano River only about a mile from downtown Llano. There is a short trail to the Llano River. Wildflowers were blooming beside the trail when we were there. Go here for my review of this park. Wow! Loved this. So much for us to look forward to whenever we get out west! Hi Beth and Henry! Enchanted Rock looks a bit like Stone Mountain! I like the Train Station and the BBQ shot got me hungry! The Enchanted Rock looks a lot like Stone Mountain in Georgia. It does look a lot like Stone Mountain only it is a pinkish color. Neat pictures… but I thought for sure that that was Stone Mountain! I am headed to Texas Hill Country this summer. I have noted a few things to do from reading your blog! It does look a lot like Stone Mountain. I’m so glad you’ve gotten some ideas of things to do in the hill country. We didn’t have time to see everything we wanted. Be sure to stop at a visitor’s center to pick up a brochure for more ideas of things to see and do. Wow, 56 floors! That is a lot of going up hill. Great excercise too. Small towns are the best. I bet the fiddling was great. The fiddling was toe tapping good! I love it when we stumble on an event like that.